multidisciplinary opera/Music-THEATER about the exceptional life, explorations and brilliant inventions of Nikola Tesla. a provocative 90 minute multimedia opera exploring epic conflicts at the intersections of the natural universe, technology and humanity. A 70-minute trip “down the rabbit hole.” This contemporary music-theater journey hurtles through a kaleidoscopically shifting mental landscape, past the borderline between hilarity and madness, into a surrealistic dislocation. based on Hamlet, prince of denmark by william shakespeare. for the New york shakespeare festival/public theater. Symphony No. 4 (Biodiversity) and Symphony No. 5 is a recording project of SoBe ArtS A four-movement reflection on biodiversity and the plight of our worldwide ecosystems, REFLECTING a vision of the grandeur and fragility of the natural world. Music by Carson Kievman, Libretto by Carson Kievman and Mark David Needle. 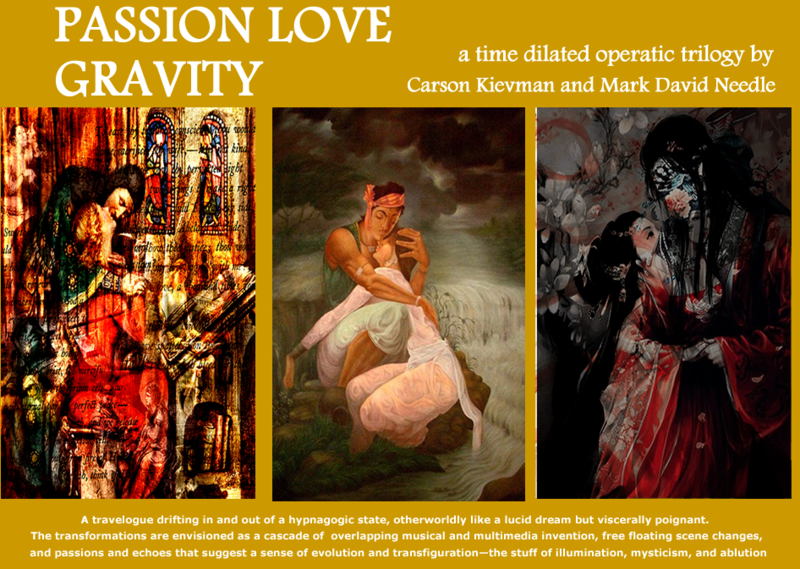 A time dialated opera trilogy. Illuminating three stories of love from the past millennium. Like a travelogue drifting in and out of a hypnagogic state, otherworldly like a lucid dream.